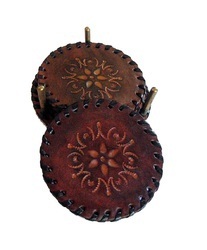 Our range of products include medieval leather tea coaster. It is made by handmade leather stamped designs on the leather. the size of the coaster is 10cm. It is 4 coaster with stand. 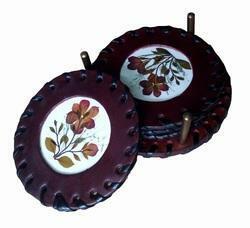 we also make coster as per customer specifications. It is made by handmade leather with dry flower decorations. we did laminated the decorations. the size of the coaster is 10cm. It is 4 coaster with stand. we also make coaster as per customer specifications. Looking for Leather Tea Coaster ?